with beautiful views of the grounds and nature. Surrounding the Lake are fire pits, fishing docks, and a canoe for each cabin. Its what makes the Hocking Hills great. 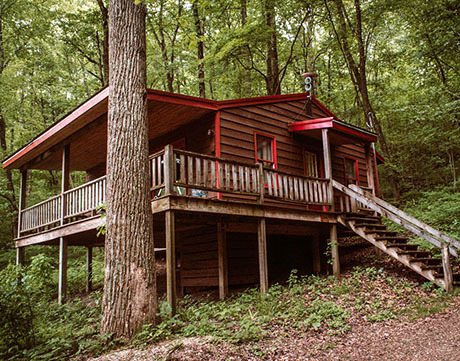 Our Six Cabins are nestled in a very secluded valley in the Hocking Hills Region. Located near the State Parks and hiking trails all of which are within a 15 to 20 minute drive. The 20 Acre property is situated 1/4 mile down our private wooded drive. Upon arrival the property opens up with the main feature being a 2.5 acre lake. 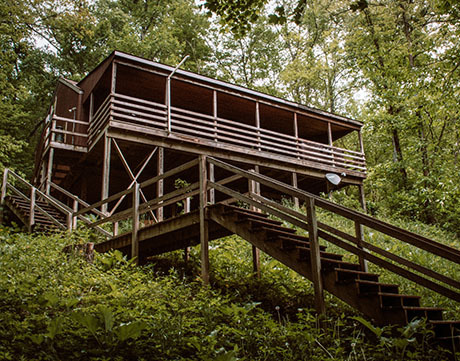 The cabins are all located around the lake providing beautiful views of the grounds and nature. We have chosen to utilize this property as a nature preserve so there are many opportunities to view the wildlife as they consider these grounds a safe haven. Surrounding the Lake are fire pits, fishing docks, and a canoe for each cabin. In addition there is a community swim platform in the center of the lake. The grounds provide for a very family and couple oriented environment. And of course we are always pet friendly. 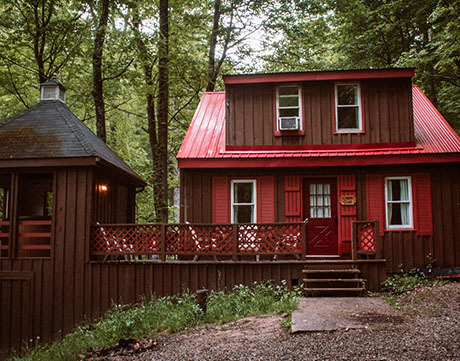 All of the cabins are far enough away from one another to provide seclusion and privacy for a Romantic get away. Yet close enough to facilitate multiple cabin rentals for groups and family reunions. 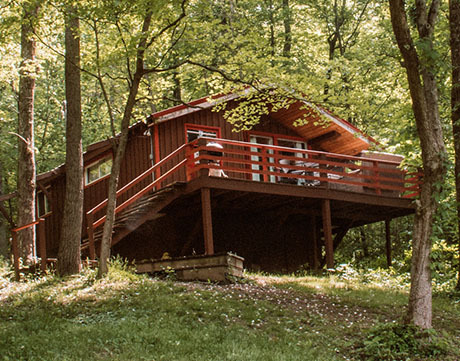 "Those seeking privacy and tranquility in the deep woods of the Hocking Hills will find them at Wyandot Woods. 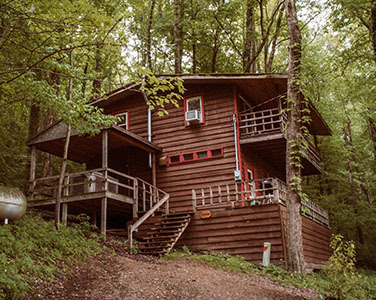 Here six cabins lie nestled in the trees around a spring-fed lake. 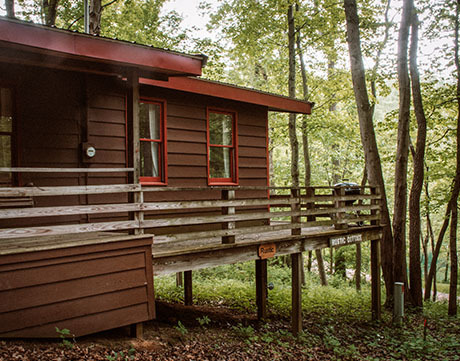 The cabins are well separated from one another, and each has a private dock on the lake - a perfect spot to fish for largemouth bass and bluegill or to launch one of the rowboats or canoes provided for guests. Lake swimming is a favorite summer pastime here, or you can loll and sunbathe out on the diving platform floating in the center of the lake. Whatever you choose to do here, the limited number of cabins ensures that you will never encounter a crowd."